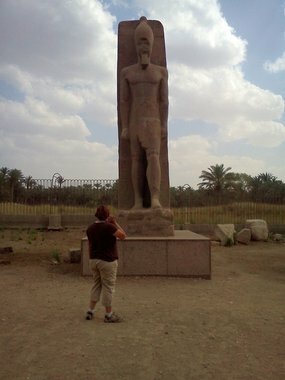 Walking in Memphis, Egypt - "But do I really feel the way I feel?" How Memphis likely looked originally. I remember a time about 20 years ago driving across the country in an old Mustang with broken out windows and the radio blaring Marc Cohn's "Walking in Memphis". It seemed like the world couldn't get any bigger then, but I never could imagined that some day I'd be walking in another Memphis. One of the oldest cities on earth, home of Ramses II, giants, and a vast capital to the world in a time before gospel, catfish and Elvis. The Memphis Museum in Egypt..
As we stopped at the Museum and walked past the first gate of security, a tourist policeman shadowed us at the window to purchase our tickets. As mentioned before, we felt a sense of relief as the ticket agent was forced under scrutiny to count back the money to us in an accurate manner. We entered a second pair of gates where a single lone vendor promised us cheap cold coca-colas for five Egyptian pounds.. Inside was fairly quiet as we stood in awe of the five story statue of Ramses the II on his back. His legs broken from various attempts to relocate him in the past to Paris or Britain. 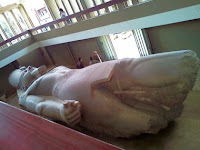 So great, even modern society could not remove him from Egypt, and therefore modern Memphis decided to build a museum around this giant statue. 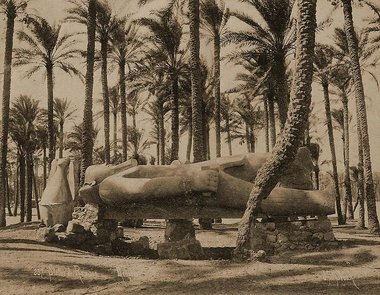 This photo depicts the unearthing of the Ramses II Statue. If that's not the greatest lawn gnome ever I don't know what is. It's hard to grasp the size of the statue from our photos- but let's just say it's massive. Then try imagine the fact that when it was carved it was done so from a single piece of rock, placed into a vertical position, and its details carved with a precise perfection that permitted no room for mistakes. It's a phenomenal feat of talent and art and that is before you realize how old it is. 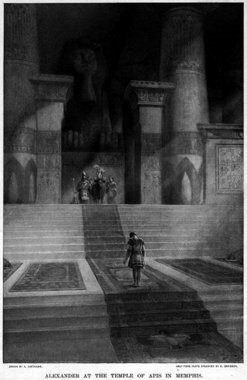 Memphis itself is mentioned in many ancient texts. It's a feeling of something "biblical", "wrath of god" type stuff to quote Ghostbusters. It makes you feel small, it makes you question how much truth is in fairy tales, and what kind of world used to exist. 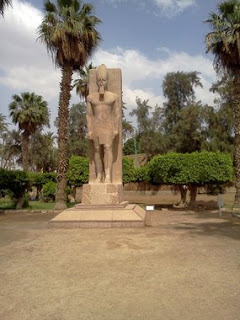 I'm reminded by this in the Cairo Museum the next day as I see Egyptian statues of dragons. Dragons? Though all that remains of this once great time in mankind's history is kept here in this mostly out-door museum with relics being scattered throughout the adjacent area. Even the massive statue of Ramses is housed in more of a canopied picnic shelter than a real indoor structure. I suspect with regime change and a proper tourism department these facilities could be properly improved to rightfully protect the relics, if Egypt manages to elect the proper person come this fall. It's sad to think the majority of these pieces sit outside in a garden unprotected from the elements. To think about what effort went into creating all this, and that modern man doesn't even have the desire to toss a building up around them and air condition them (for their sake not the tourists) seems a tad bit backwards, if not ironic. The one thing you may be interested is in Memphis is that there is one of many doorways to the afterlife. Unfortunately its closed at the moment and protected with plexiglass... so you may want to find another one. Not actual size. Or maybe not? Again it takes some difficulty to wrap your head around this place. 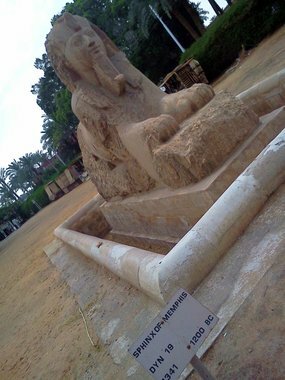 For instance this sign (above-left) indicating this statue is of the 19th dynasty or 1200 BC left us in awe. Think about that. 1200 years before Christ. It's 2011. That's 3200 some years ago. It's just mind blowing to me. I just find it so interesting that here in America we've created a museum to Noah's Ark, which despite your personal beliefs, the "museum" contains no actual physical bits of history at all on display. Yet Egyptian history, the physical history of ancient mankind such as what's in Egypt, remains in some remote suburb of Cairo and continues to be destroyed by the elements. Men bathing in sewer-water in canals of trash around the greatest empire in human history but in Paris sits the Mona Lisa. It's just kind of funny what we as humans choose to cherish. If I had to guess as to why the ancient Egyptians would have chosen to carve their lives in stone rather than paper, to build pyramids as vaults to their culture then I think, I hope that, most people would agree it was for preservation- to save something important- yet the irony of which their descendants, you and me- the people of Egypt neglect and overlook this great ark of history is tragic. I find it odd that most Americans will never see this stuff, many too intimidated to go, yet they expect to participate in a world built on the backs of this history. It's rather quite tragic.